In a car, in a meeting, in the library, clambering up a mountain face—the list of places where it's not convenient to take a call is almost endless. 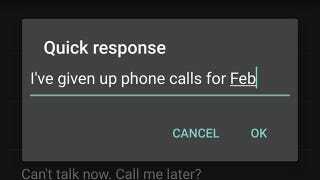 The latest versions of Android include an SMS auto-response feature you can use to fire back a text if you can't pick up. Here's how to activate it and customize the messages to suit your needs. Open up the Phone app and tap the menu button (those three vertical dots top right). Choose Settings then General settings and tap on the Quick responses entry; this is where all of your automatic SMSes live. You're limited to four in total, but you can edit any of them with a tap, so make sure all of the most common scenarios are covered. When a call is coming through (assuming your phone screen is locked), slide up the answer icon to the text message symbol and your quick responses pop up (together with a Write your own option you can use to compose something off the cuff). If your phone isn't locked when it starts to ring, the call notification appears as a small alert at the top of the display—tap on the top of the notification to make it full-screen (don't tap Dismiss or Answer), then drag up the answer icon as normal to find your quick responses.